Say hello to the Lenovo ThinkPad X220, a splendid example of the Chinese manufacturer's commitment to powerful business machines. Weighing only 1.7kg, the ThinkPad X220 can easily be carried around for a day and its briefcase-friendly 306 x 232 x 33mm dimensions make it an excellent choice for a regular traveller. The laptop itself would even be slightly smaller if it didn't have the battery protruding from the back of the chassis. But, we'll take the extra weight as the Lenovo ThinkPad X220 gave us an sizeable 308 minutes of battery life. Part of the portability comes from the 12.1-inch display - much smaller than the conventional 15.6-inch laptop and the Lenovo is better for it. The lack of a Super-TFT reflective shine means you can use this laptop comfortably in bright-light environments such as offices and airports. The 1,366 x 768 resolution means the screen can manage 720p high-definition. Needless to say, the screen isn't really suited to watching movies. It's bright enough, but the crispness and colour isn't what you'd find on a dedicated media laptop. Neither is the space - the X220 has a 160GB SSD hard drive that, while great for portability, won't store a massive media library on the go. The keyboard is an old-fashioned layout that looks a world away from the sleek black isolation-style keys seen on an HP Envy 17 or Macbook Pro. But it quickly becomes apparent that the keys are excellent for typing on. The keyboard takes up all the available space, and the large, embossed keys are comfortable. The unfortunate caveat is that the touchpad is very cramped. The integrated click buttons curve over the palm rest at the bottom and can be awkward to hit. Lenovo has included a TrackPoint pointer as an alternative, but we still found the touchpad easier to navigate. Where the business credentials really count however, is in this laptop's connectivity and extra features. There's a fingerprint scanner on the right palm rest for extra software security, as well as a Kensington lock for keeping the laptop itself safe. The performance of the Intel Core i7 2640M processor is excellent. It managed to score 11,444 in our Cinebench benchmarks which means you can easily multi-task with multiple applications with no slow down evident. However, if you are looking for a machine to push 3D polygons while trying to snipe your friend from 400 yards, you could do better to look elsewhere. The GPU is an integrated Intel affair as part of the Sandy Bridge CPU. While more than capable of playing HD video and editing photos, the X220 will struggle with modern games. 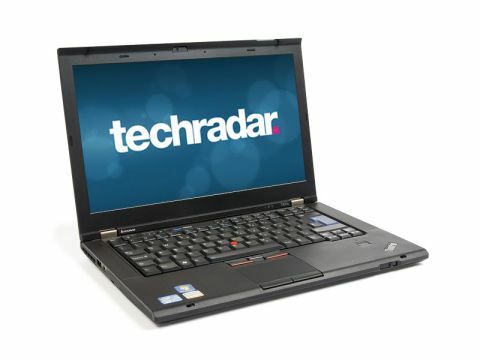 Although the ThinkPad X220 doesn't include an optical drive, you're offered a multitude of connection ports in its place. There are three USB slots, one of which is the newer, faster USB 3.0, an Ethernet port, an SD Card slot, Express Card slot, VGA port and Display port. For a business laptop, this is the gold standard. Everyday users will want to look elsewhere, but the ThinkPad X220 is one of the best choices for the business executive.